Lions (Panthera leo) are the largest of all African cats. Once roaming most of Africa, as well as large parts of Europe, the Middle East, and Asia, today they are found in patches in Africa and one population on the Indian subcontinent. They are the second largest cat species in the world, smaller than only the tiger. Today there are less than 40,000 lions on our planet, but lions were much more common and widespread in the past: they disappeared from Europe in the 1st century CE, and from the Middle East and most of Asia by 1950. About 73,000 years ago, ancient shifts in the African climate segregated the lions into small groups, and over time characteristics evolved to match the separate environments: some larger, some with larger manes or darker coats. The largest of these was the Barbary lion of North Africa, which measured some 27–30 feet long with a long, serpentine tail of 3.5 feet. Geneticists have identified two subspecies of lion: Panthera leo leo (found in India, North, Central, and West Africa) and P. l. melanochaita (in Eastern and Southern Africa). These lions have coats that range in color from nearly white to tawny yellow, ash brown, ochre, and deep orange-brown. They have a tuft of dark fur at the tip of their tail, are typically about 5.5–8.5 feet long and weigh between 330 and 550 pounds. Male and female lions exhibit sexual dimorphism: Female lions are smaller than males and have a uniformly colored coat of a tawny brown color. Females also lack a mane. Males have a thick, woolly mane of fur that frames their face and covers their neck. 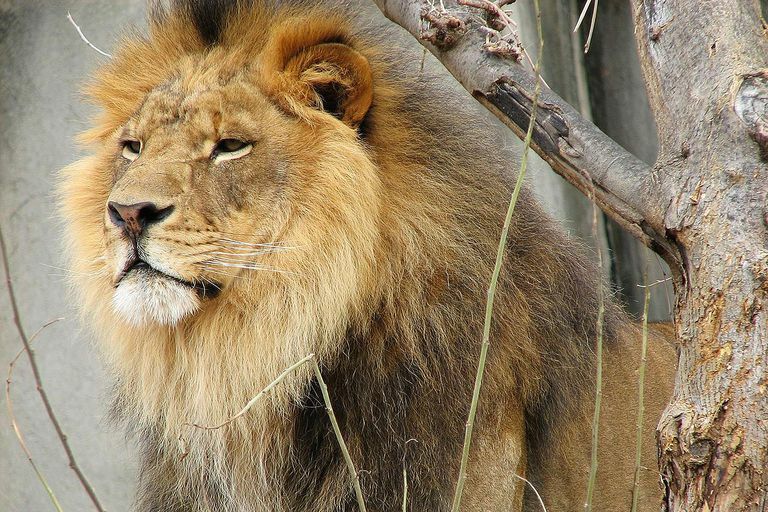 Lions' closest living relatives are the Jaguars, followed by leopards and tigers. They have two recognized extinct ancestors, the American lion (Panthera atrox) and the cave lion (Panthera fossilis). Although they primarily are found in savanna areas, lions can be found everywhere in Africa, except the tropical rainforest and the interior of the Sahara desert. They live in habitats from sea level to the mountain slopes up to 13,700 feet including Mt. Kilimanjaro. The dry deciduous Gir forest of northwest India contains a lion preserve known as the Gir National Park and Wildlife Sanctuary. Surrounding the sanctuary is an area inhabited by ethnic Maldharies pastoralists and their livestock. Lions are carnivores, a subgroup of mammals that also includes animals such as bears, dogs, raccoons, mustelids, civets, hyenas, and the aardwolf. Lion prey preference is for medium to large ungulates like gemsbok and other antelopes, buffalo, giraffes, zebras, and wildebeest; but they will eat almost any animal, from rodents to rhinoceros. They avoid animals with sharp horns (like sable antelope), or animals smart enough to graze in large herds (like elands). Warthogs are smaller than lion typical preferences, but since they are common in the savannas, they are common parts of lion diets. In India, lions eat domestic cattle when available, but mostly consume wild Chital deer. Lions drink water when available, but otherwise, get required moisture from their prey or from plants like tsamma melons in the Kalahari desert. Lions live in densities between 1.5 to 55 adult animals per 38.6 square miles (1 square kilometer). They are social creatures and live in groups of about four to six adults called prides. Prides typically include two males and three or four females and their offspring; the adults leave the prides to hunt in pairs or singly. Prides in India tend to be smaller in size, with two females. Lions play-fight as a means of honing their hunting skills. When they play-fight, they don't bare their teeth, keeping their claws retracted so as to not inflict injury on their partner. Play-fighting is a training and practice exercise, to assist in efficiency in tackling prey and to establish relationships among the pride members. It is during play that lions work out which members of the pride are to chase and corner their quarry and which members of the pride are the ones to go in for a kill. Lions reproduce sexually. They mate year-round, but breeding usually peaks during the rainy season. Their gestation lasts between 110 and 119 days. A litter usually consists of between one and six lion cubs. Females reach sexual maturity at 4 years and males at 5 years. The International Union for Conservation of Nature (IUCN) classifies all subspecies of lion as vulnerable, and in 2013, the ECOS Environmental Conservation Online System in the United States classified P.l. leo as endangered, and P.l. melanochaita as threatened. Major threats to lions include habitat and prey loss resulting from a growing human population and climate change, as well as invasive species, agricultural effluents, diseases like canine distemper, and human retaliation for lion attacks. Illegal hunting and poaching for medicinal purposes and trophies have also impacted lion populations. Legal sport hunting is considered a useful management tool, providing needed income at sanctuary facilities if it is conducted at a sustainable offtake of about one male lion per 775 square miles. Levels higher than that have been documented in several countries in Africa as detrimental to the overall lion populations. Modern cats first appeared about 10.8 million years ago. Lions, along with jaguars, leopards, tigers, snow leopards, and clouded leopards, split off from all other cat lineages early in the evolution of the cat family and today form what is known as the Panthera lineage. Lions shared a common ancestor with jaguars which lived about 810,000 years ago. Bauer, H., and S. Van Der Merwe. "Inventory of Free-Ranging Lions Panthera Leo in Africa." Oryx 38.1 (2004): 26-31. Print. Evans, Sara. "When the Last Lion Roars: The Rise and Fall of the King of the Beasts." London: Bloomsbury Publishing, 2018. Hayward, Matt W., and Graham I. H. Kerley. "Prey Preferences of the Lion (Panthera Leo)." Journal of Zoology 267.3 (2005): 309–22. Print. Riggio, Jason, et al. "The Size of Savannah Africa: A Lion’s (Panthera Leo) View." Biodiversity and Conservation 22.1 (2013): 17–35. Print. Singh, H.S. "The Gir Lion: Panthera Leo-persica: a Natural History, Conservation Status, and Future Prospect." Gujarat, India: Pugmark Qmulus Consortium, 2007. "Species Profile for Lion (Panthera leo ssp. leo)." ECOS Environmental Conservation Online System. U.S. Fish and Wildlife Service, 2016. "Species Profile for Lion (Panthera leo ssp. melanochaita)." ECOS Environmental Conservation Online System. U.S. 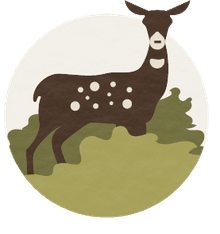 Fish and Wildlife Service, 2016. Is There Such a Thing as a Black Lion?